If I had to choose the two books to take with me on a desert island, it would probably be this pair. Mind you, if I could find an edition that had them both in the one book, that would be very cool, because it would give me another option to choose in addition to them. But, in all seriousness, I re-read these books at least once a year, sometimes more frequently, as the battered copy of the first of them shows! I took them with me to hospital recently, and found them, as always, incredibly grounding in their familiarity, but again, found new insights in the text. 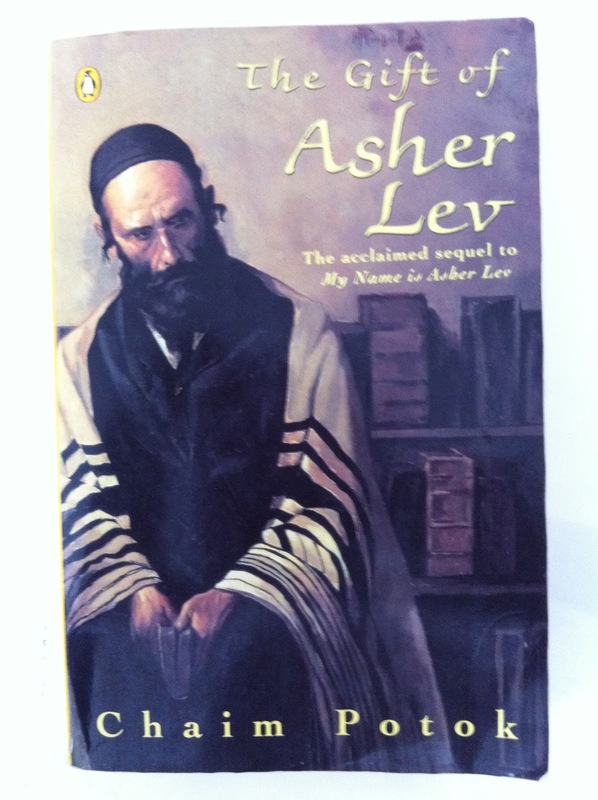 My Name is Asher Lev is set in the Chassidic world of post-war Brooklyn. Asher Lev is a small boy, the only child of Aryeh Lev, right hand man to the Rebbe of their particular Chassidic group, the Ladover. Aryeh's life is spent traveling for the Rebbe; around the United States, and overseas, bringing people to Ladover communities, setting up new communities with yeshivot (schools) and community services, leaving Asher and his mother, Rivka at home. At six, Asher is already showing that he has a precocious and disturbing gift - drawing. Within this ultra-Orthodox environment, the injunction against making images makes Asher's gift all the more disturbing. When he says he can't help himself, Aryeh's response is angry, saying that only animals can't hep themselves, and that it is not a gift from G-d, it has come from the 'other side', that it can only do harm. This sets up the ongoing conflict between father and son, which is the template for a collection of conflicts that pepper this story. When Rivka's beloved brother dies in a car accident while on business for the Rebbe in Chicago, she suffers a breakdown that requires Aryeh to stay closer to home. This frustrates him, and brings he and Asher into closer contact and more conflict. As Rivka slowly recovers, so does Aryeh's traveling recommence, but with a difference. Rivka spends all her time while he is away anxiously awaiting his return, fearing that something will happen to him too, as it did her brother. It also creates tensions when Asher is late home unexpectedly, to be greeted by her with anger and hysteria. He stops drawing. He tries to do better at school. But he is lost without his drawing, and in the undercurrents of conversations that swirl around him but don't involve him. At school, he is taunted by the other boys for his difference, and partly because they are envious of his father's position close to the Rebbe. Then comes the day at school when he finds himself confronted by a picture of the Rebbe that he has drawn without being aware of doing it, on the pages of a Chumash (a bound edition of the Torah, complete with commentaries). This is an act of desecration and he finds himself at the centre of a maelstrom at the yeshiva. But, the gift is clearly back. And having suffered through the period of not being able to draw, he refuses to give it up again. Then comes his next challenge. Rivka, having been granted permission by the Rebbe to study, has now finished her studies and Aryeh is being sent to Vienna. The idea is for the whole family to go, so that Aryeh can go on with the work of bringing Jews out of Russia. Asher, terrified by the idea of leaving his street and his community, refuses to leave. The alternatives are for him to live with his uncle - Aryeh's brother - or Leah, his mother's sister in Boston. He says he can't do that either. In the end, Aryeh leaves by himself, and Rivka stays behind with Asher. During this time, the Rebbe asks to see Asher. Unbeknown to Asher, the Rebbe has been keeping a close eye on the situation, and is well aware of the gift and all the associated conflict. He enlists the help of an old associate, the artist Jacob Kahn, to teach Asher. Kahn is no longer observant, but the Rebbe trusts him to teach Asher and respect the boy's family values. So begins for Asher a different journey, into the world of fine art, the world of Picasso, Chagall, Modigliani, and Kahn himself. During this time, Rivka gains her Masters degree, and announces that she can no longer leave Aryeh alone in Vienna. Asher again refuses to leave Brooklyn, and this time, moves in with his uncle, who sets him up in the attic of their house so he can paint. His summers are spent with the Kahns at their summer house on Cap Cod. Kahn challenges the boy constantly, telling him that he must find the truth in what he paints, and deal with his demons. When Aryeh and Rivka come back to New York, it is to discover that their precocious son has grown up, he is an artist. He is still observant, but he treads a fine line between their world and that of the unknown - to them. While he cites Chagall to them as an example, they are all too aware that Chagall walked away from his community in order to paint, and painted commissions for Christian clients as well as Jewish institutions. Kahn tells Asher it is time for him to travel, so armed with directions to Ladover communities all over Europe, Asher sets off on his own 'grand tour'. He settles in Paris, in an apartment close to the Ladover yeshiva. Away from Brooklyn, the demons of his childhood, his mother's interminable waiting by the window, watching for Aryeh to return from his travels, the ongoing conflict with his father, all surface and are realised in the painting of two major works. When visited by Anna Shaeffer, the owner of the gallery representing Kahn, and now the young Lev, she tells him that they are his first truly great paintings. That she will take them for his next show. It is the first show where there are no nudes. The first show that, when he goes back to New York for the opening, that his parents will attend because he has told them there are no nudes. The two giant paintings are placed so that they are the final pieces to be seen after the journey through the rest of his show...and they are crucifixions. Asher has placed his mother against the crossbars of the window frame while waiting for his father, in a traditional crucifixion pose. His parents are completely unprepared, and are devastated, leaving the opening as everyone else in the gallery realises who they are and what has occurred. It is the final straw for Aryeh. The Rebbe calls Asher to meet with him and tells him that he must leave the community for a time, to go back to France, to allow the hurt he has caused to heal. Asher leaves, and goes into exile. 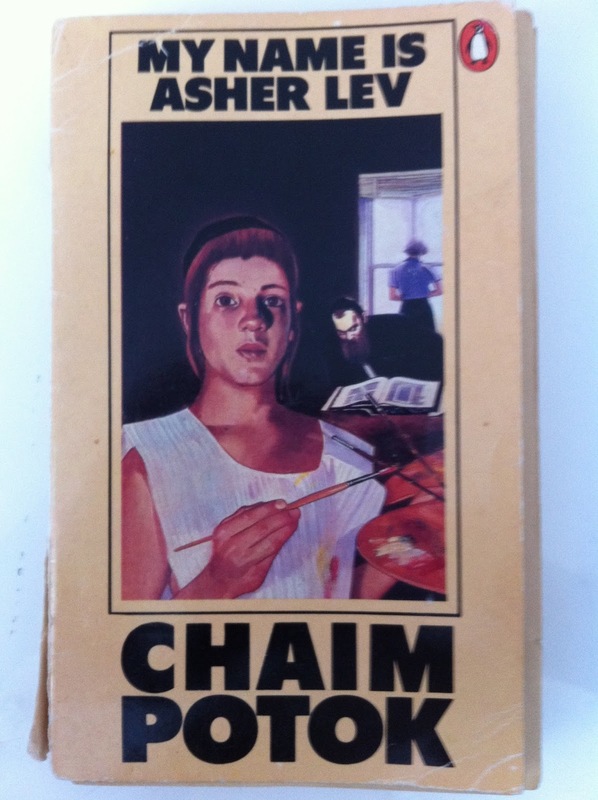 The Gift of Asher Lev picks up some many years later, in the south of France. Asher is living just outside a village where his wife, Dev, has a cousin, also an artist. They have two children, Rochel and Avrumel. After many years of living and working in Paris, they have moved to the country for Rochel's health. The child is severely asthmatic, even her father's studio is out of bounds to her. She is an old soul in a child's body. Dev is a child of the Holocaust, having survived the war in hiding with her cousin Max and his parents after her parents were picked up in a round up. She is haunted by ghosts, and buries herself in writing children's books. Jacob and Tanya Kahn live nearby, and eventually Jacob dies there, at home. Asher has become a great artist, but at this time, has hit a dry spot. Then his uncle dies, the uncle who housed him while his parents lived in Europe. They have to go to Brooklyn for the funeral. It is the first time Asher has been back in his community in many, many years, and Dev's first time living in the bosom of a vibrant Ladover community. Rivka and Aryeh have time to enjoy their grandchildren, and press Asher to stay beyond the seven day period of shiva (mourning). He says he has to get back to France, to work, and the children must go back as they are due to go back to school. The suggestion that they enroll at the yeshiva in Brooklyn he meets with suspicion, but in the face of Dev's enjoyment building a relationship with Rivka, and the children's clear happiness, he concedes. The time continues to pass. He wants to go back to France, having promised Max to collaborate with him on a complex print making process. He visits the gallery, now managed by Anna's son, Doug. Doug pesters him for work for a show, but Asher demures, saying he's not painting. However, he is drawing. Many pictures of Avrumel. Even the abstract pictures, Rochel says, have Avrumel in them one way or another, which Dev also realises when she finally gets to look through them. Doug says he'll show the drawings. Meanwhile, Asher grandually realises that there is something much bigger going on. He goes back to France without his family to work with Max on the print in Paris. He goes back to their home in the south of France, sees Tanya Kahn, sees their neighbour John, tries to paint and finds he is still blocked. Returning to Brooklyn, he finds the children enrolled in summer camps - Rochel is away from home at a residential camp, Avrumel is at a day camp in the city. The Rebbe is getting very old, and has no sons. Chassidic movements like the Ladover are dynastic, and there is no one to follow the Rebbe. Except, possibly, Aryeh. But that can only happen if there is someone to follow HIM. And that can't be Asher, because Asher is the painter... Periodically, the Rebbe calls upon Asher to visit him. He sympathises with Asher's painting block, remembering that Jacob Kahn also had similar periods. He poses enigmatic riddles to Asher, which make their way into the drawings, the drawings that keep featuring Avrumel. Slowly he comes to understand that the gift he can give back to his community, the redemption he can gain after the hurt he caused with the crucifixion paintings, can be gained by allowing Avrumel to grow up among them, and become heir to his father...who will one day take the Rebbe's place as leader of the Ladover. What I've written is the tip of the iceberg with these books. They are far more complex and detailed than I have described. There are other small stories woven into the main narrative of both books, and the intricacies of living a fully observant life as Torah Jews is treated with sympathy and grace. The world of the Chassidim, viewed from the position of the reader of a Potok book is one that I find enormously attractive. There is an overall simplicity in living a life that is dictated by halachah (Jewish Law) - things are done a certain way because halachah states that that's how they be done. However, it's never that simple. There are arguments and discussions always, about the degrees of observance, the scholarship of those debating the finer points of the law, and the restrictions that are placed as a consequence. For all that, there is still a clarity about how to live that can be harder to find when the way of observance is more interpretive, as is the tradition in non-Orthodox streams of Jewish practice. For myself, these books speak to me of many things. They speak of values that are too fast disappearing in many communities. They draw detailed portraits of people struggling to reconcile what they understand to be right and true with things that don't fit their worlds. There is, in each of the main characters, a striving to find their own truth and live it out within the world of the Ladover Chassidim - for Asher not to give up on his community regardless of how difficult it is for him to still fit in; for Aryeh to find his way back to a meaningful relationship with his son, even though Asher's work represents much of what he sees as evil and wrong in the world; for Rivka, to not get caught between Asher and Aryeh, and also to keep hold of herself; for Dev to find peace from her ghosts, and a life that offers joy again, despite having to deal with living with an artist whose work can create anything BUT peace; and again, for Asher, to find peace in the gift of his son to the community to ensure that all the work of the Rebbe and his father is not lost due to his own need.